Foam blank, 2 x 1/4'' stringers, Volan glassed with 2'' overlap.Post production legrope tab. Dorsal, 9" x10" base @ 3''. 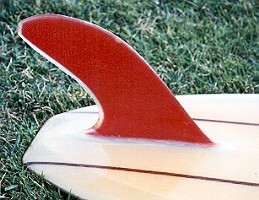 Red fibreglass. Slight foiling to rear edge.